Warmer weather is coming!! Tarpon have started making there way to the keys. With temperatures in the mid to upper 70's and even low 80's the flats will be warming up. Warmer waters around the keys will have tarpon starting to making more appearances on flats and canels. Many guides have reported seeing numerous permit and bonefish on the flats. 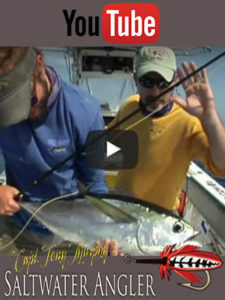 Cudas this time of year are plentiful on the flats whether on fly or light spinning gear they can really make your fishing adventure memorable. Offshore remains steady with very similar fishing conditions to the last couple of weeks Plenty of bait offshore continues to help reef fishing. Look for yellow tail snapper to be very aggressive just outside the reef line in 40-60 feet of water. 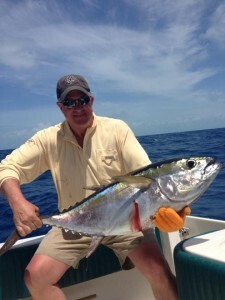 The Tuna also remain abundant in a mix bag of Bonita's and skip jacks too. Stocking up on as much live bait you can find will help you out hooking up with these brutes. Some captains are finding some Dolphin on color changes and temperature breaks farther offshore. We have seen quite a few sailfish caught this week offshore. Whatever trip you have planned, we here at the Salt water Angler wish you tight lines and fish boat side! Tagged charterboat fish key west, fish key west, fishing, fishing florida keys, key west fishing, key west fishing boat, key west fishing charters, key west flats fishing, key west offshore fishing. Bookmark the permalink.